For the English footballers, see Billy Edwards (footballer, born 1952) and Billy Edwards (footballer, born 1896). Billy Edwards (December 21, 1844 in Birmingham, Warwickshire, England – August 12, 1907) was a standout lightweight of the late 1860s and 1870s in England. Nicknamed "Make-Believe Billy", Edwards began boxing at the age of 14 and fought Sam Collyer on August 24, 1868 for the American Lightweight Championship. Edwards won the fight in the 34th-round to win the title. Edwards fought Hall of Famer Charlie Mitchell in 1884, losing in the 3rd round. Following the Mitchell bout, Edwards retired from the ring but remained in boxing by training John L. Sullivan for several winning contests. Edwards was a successful real estate investor after retiring. 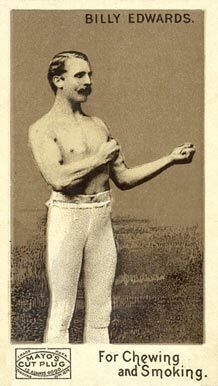 In 1894 Edwards appeared as himself in the Edison Company's kinetoscope film Billy Edwards and the Unknown Boxer, in a pre-determined-outcome exhibition match against a random boxer. This film survives and is preserved in the Library of Congress. Edwards died of Bright's Disease on August 13, 1907 in Brooklyn. Edwards has been elected to the International Boxing Hall of Fame. This page was last edited on 24 August 2018, at 17:43 (UTC).